Since the egg council hooked us with their jingle, “the incredible, edible egg” Americans have developed a deep love affair with the egg. 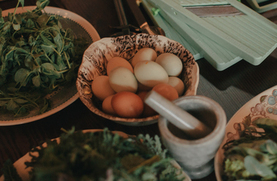 Join us as chef Jason French looks at the origins of gastronomic “eggsploration" through the eyes of the French, the original pioneers of egg cookery. This class is a combination of hands on and demonstration. Please bring a sharp knife and an apron. A very eggy supper will be served with a bit of wine at the end of the workshop.